RALEIGH (Jan. 5, 2016) – Since North Carolina’s last bond referendum 15 years ago, 2 million people – the equivalent of the entire state of Nebraska – have moved to North Carolina. “Two million people is a gigantic burden to be placed on our infrastructure,” Jim Rose, a regional president for Yadkin Bank, told several hundred supporters at the kickoff rally for the Connect NC bond campaign at NC State University. The $2 billion bond proposal – which voters will be asked to decide in North Carolina’s primary election March 15 – includes $980 million for university projects and $350 million for community colleges. Most of the projects focus on STEM (science, technology, engineering and math) fields. McCrory noted that UNC Charlotte opened its current Science Building in 1985. “Since then, their enrollment has grown 142 percent – 142 percent,” he said. The building poses what McCrory described as “a maintenance nightmare,” and the university would receive $90 million from the bond issue to replace it. Similarly, NC A&T State University would receive money for a building to house its engineering programs. 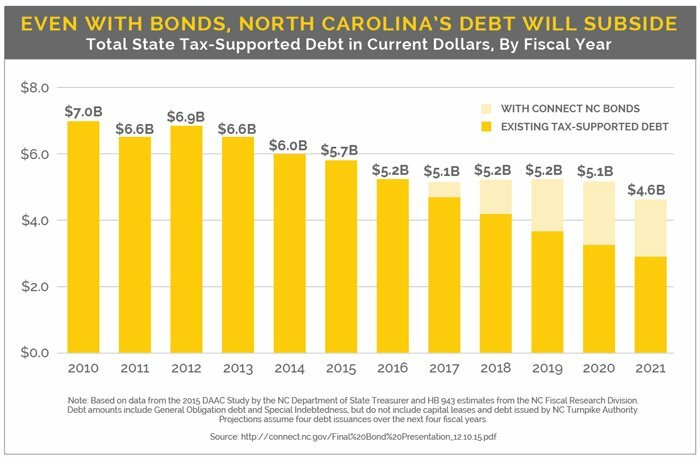 The governor said that because of the rate the state is paying off debt, the state’s total debt will continue to decline even if the bonds are approved. Ann Goodnight, a former member of the University system’s Board of Governors, said that by 2018, jobs are projected to grow by 24% in STEM fields, 27% in health professions and 29% in finance. McCrory also noted shortages of mechanics, nurses, welders, electricians and IT personnel. “That’s what we’re going to continue to emphasize in our great community-college system,” he said. McCrory and his opponent in the 2012 governor’s race – Walter Dalton, now president of Isothermal Community College – noted that Democrats and Republicans are both part of the effort to win approval of the bonds. “You keep North Carolina strong by keeping North Carolina’s economy strong – and you do that by investing in higher education,” he said. North Carolina’s community colleges train more than 800,000 people a year and are arguably the strongest system in the nation. “But it will not stay that way unless the people of North Carolina continue to invest in it,” Dalton said. The bond package includes $75 million for state parks, $25 million for the N.C. Zoo, $79 million to update National Guard Readiness Centers, $179 million for agriculture projects and $309 million for water and sewer projects in rural North Carolina. Rose concluded by asking anyone in the room who had used the state university or community college systems, drunk clean water or consumed food from the state’s farmers to raise their hand.